The overland railway from Oslo to Bergen was supposed to be the most beautiful train route in Europe, and I did not have a window seat. This unfortunate turn of events was not necessarily an entirely negative circumstance, I silently lied, as I would then be forced to actually enjoy the scenery myself instead of taking hundreds of photos. By the end of the seven-hour journey I had still produced the better half of a thousand, the majority rendered arguably unusable by the discarded paper cups of free coffee and open-mouthed sleeping passengers framing the breathtaking snow fields, mountain crests, ice-covered lakes, and waterfalls outside. I did not care that much. That much. The couple sitting beside me was all over each other. Every few minutes the woman would turn away from her own window, bury her face into her boyfriend’s neck, and proceed to emit obnoxious lip-smacking noises that I could only assume meant that his epidermal capillaries would not escape unscathed. He would respond by pulling his arm around her parka and jerking her into his skinny chest. I endeavored to ignore them. This proved a difficult task for seven hours. I found myself restless, standing up every several minutes to walk to the back of the train car and refill my own free paper cup of green tea with lemon, then espresso drinks and hot chocolate from the onboard machine. This ritual served only to increase my cerebral blood volume and therefore attentional energy available to hyperfocus on the noxious stimuli beside me. I kept my music loud. The train broke through the darkness of its latest tunnel into a forest of white mountains, covered entirely in snow from crest to foot. I kept snapping photos like I would be dead the next day. And the truth was that I would be—passed on from this still paradise of black-faced mountains and gleaming ice, enjoyed safely through a thick wall of glass from a comfortable cushion with unlimited free hot drinks. Back instead to drown bodily in a noisy purgatory of risk and reward seeping in from all sides to fill every pore and cavity from larynx to bowels from outside in and back outward again with the evacuating poisons of constant change. The woman across the aisle from me turned away from her fat hardcover and searched my face in a way that rendered 90% certain the possibility that she was going to start a conversation. I braced myself. We locked eyes and she rattled off a few sentences of crisp and curly Norwegian Danish, clean of the mashed potato crust caking its guttural southern cousin. I surmised that she had been inspired by my probably intrusive photographic whirlings in the aisle to generously offer me the empty window seat next to her. I nodded and smiled dumbly, not wanting to accept until I was certain. The woman took the hint. “Do you speak English?” she asked, my own language suddenly rendered as baroque as her mother tongue. “Yes, yes,” I replied sheepishly. “If you would like to take photographs, you can sit in the empty seat next to me.” There it was. My face broke into a huge grin. “Yes, thank you! Mange tak. Tusind tak,” I replied, awkwardly exhausting my own withering store of remembered continental Danish, replete with the wrong amount of mashed potatoes, cold and lacking gravy. The window seat opened up a whole new world of scenery, and I needed to make the most of it before the passenger so entitled inevitably boarded at a future station. I pressed my nose to the glass, struggling to memorize the unobstructed 180 degrees of magnificent lakes and mountain ridges flashing into view between tunnels of blackout, often too fast to catch by eye alone, much less the lens of my four-year-old budget smartphone. The amorous Mediterranean couple, the impeccably dressed blonde woman with a Louie Vuitton purse, the friends towing several bags of skiing equipment kept their phones pressed to the windows, desperate to snap up every meter of passing texture and shape and roll it into digital eternity. Only the magnanimous Norwegian queen sat quietly amidst the forest of bobbing electronics, eschewing the flurry of greed to instead silently drink in her substantial book. Why did so many of us, by contrast, possess such an anxiety to harvest our fleeting experiences for safekeeping? The day before in Oslo, I had been marveling at the seaside architecture in Tjuvholmen when I passed by the Astrup Fearnley Museet, whose sandy wooden beams reflected in the glassy black water beneath were begging to be admired. The Nasjonalmuseet, closer to the city center, had been recommended to me by a friend just that morning for its high density of well-known works, notably Munch’s The Scream, but after some hours the previous week spent wandering a number of museums, zoos, and aquaria in Sweden the time had come to unravel some of the structure to the adventuring. Even if I had not been reaching my threshold of cultural saturation, I was not about to waste any of my day and a half in the capital of Norway looking at marble sculptures of naked women taking shits over the toilet or whatever the artists were coming up with these days. I was briefly pondering what horrors lay within this moderne kunstmuseum that I would decidedly not be visiting when a woman emerged from a nearby exit and marched toward me, young daughter in tow. She held out a small white square of paper. “Would you like a ticket to the museum?” she asked. Completely bewildered, I managed to choke out a “Tak” and pick it from her gloved fingers. Despite the fact that I now held in hand the equivalent of a 13-euro ticket to a museum that I had never in my life had any desire whatsoever to visit, I found myself appreciating the commensalist gesture, if only for its surrounding air of mystery. Was this woman typically in the business of recycling her admission to expensive art galleries in national capital cities? Or was she spitefully attempting to deny this particular institution an additional admission because she had had a bad experience? Had her young daughter, who had observed our exchange with sullen disinterest, been offended by one too many marble statues of naked women taking shits over the toilet? Whatever the cause of this stranger’s act, its effects had serendipitously befallen me, and it was now my turn to visit the Astrup Fearnley Museet and my retrospective charge to determine why. The museum had confirmed my expectations, proving a labyrinth of sparsely arranged photographs of unattractive people making unsettling faces into the camera, farm animals sawn longitudinally in half and preserved in formalin, metal sculptures of everyday household items hanging from the ceiling in presumably edgy ways. I had felt the minutes ticking by and did not observe any revolutions in a perspective that had become increasingly difficult to surprise over the last decade. 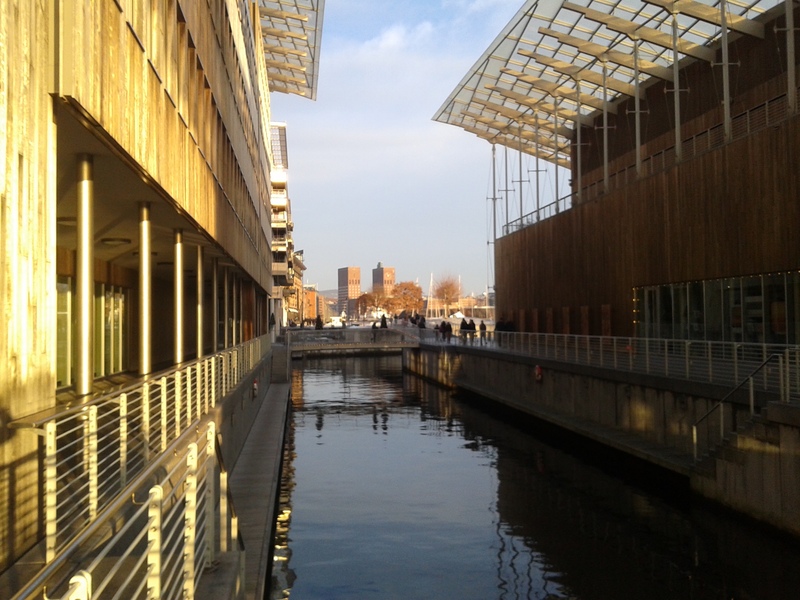 More than once, I had wondered why I was inside the Astrup Fearnley Museet instead of enjoying the sunset reflecting off the sable glass waters of the canals outside and needed to find the reason so that I could leave. Then I had seen it. On the far wall, opposite what I am sure was an aesthetically very progressive exhibit of burned newsprint stacked fifteen feet high. Viewing Reality Through a Hole Next to an Indifferent Colleague, the title had informed me. The work was a colorful painting, not a great one by technical standards, of a man pressing his face into a wall behind the figure of a human whose head had been replaced by a mosaic of colorful shapes. This was it. The reason I was in that damn museum. It spoke to me. It touched the deep reaches of my soul. I did not understand it. I so badly wanted to. Where was this hole? Who was viewing reality through it, and who was the indifferent colleague? Why was the colleague indifferent? What was this reality—no, what was reality? I had left in that moment, mind buzzing with a dozen inarticulable questions that remained unanswered to the next day, as I viewed this snowy parallel reality through the hole of the train next to a dozen indifferent colleagues. They settled and remained in the thick soup beneath my conscious ruminations as I chose to stack in the additional hole of my camera to the latent indifference of a hundred more. These holes, in the fast-moving prism traversing a route worn through by hundreds of thousands of bodies before and after me, and in the shaking box of subverted 5-megapixel reality held before my face: they erected walls that filtered and distorted my experience of the unforgiving world outside. And yet I derived satisfaction from the permanence implied by these subversive and distorting barriers to this journey through the vast wilds of Norway. The effability of Bergensbanen, missing from the thousands of faded hours logged wandering unnamed beaches on Jeju Island, darkened residential side streets in Helsinki, anonymous hutongs in Beijing now crushed forever beneath shopping streets and boutique hotels, ensured that the experience could continue to transpire at will far into the future. The words ensured understanding and assimilation into the psyche—and, with the latter, a lifetime of preservation. Packaging the qualia of the present into the semantic network of language ensured that the happenings in that moment would have certifiably happened in the future, and they would continue to have happened as long as my brain held onto them, even as the episodic memories were eventually overwritten by the ennui of continued visual existence. Importantly, however, they would have happened for me, regardless of witness by indifferent colleagues, regarding whom the key was, perhaps, to be equally indifferent. Our respective verbal eternities were, after all, not always mutually intelligible. This is where efforts with the camera came in. The passenger to whom my window seat had been rightfully allocated had arrived, and I moved back to my own seat, enjoying a few minutes of quiet from the visual onslaught. The woman across from me closed her book, stood up, and made her way back over to my seat. “You know, if you would like to take more pictures, you can buy a coffee in the dining car and sit by the window there. That is how I traveled from the north to the south of Germany,” she muttered into my ear with a conspiratorial smile. I returned her smile somewhat awkwardly, unsure of how to further respond to such thoughtful kindness. We had begun our approach into Bergen. As we descended from the mountains into the port city, elevated fields of soft snow brushed with white-tipped evergreens disappeared into black waves crashing against sharp crags of moss-covered rock. Waterfalls streamed from among jagged cliffs, spilling into the tumultuous steel-colored ocean beneath, and red- and black-painted wood houses stood wedged impossibly between the ridges. The dim light bathing the scene would be subject to capture by no photo. Regardless, I made a few halfhearted attempts to memorialize the white veins of water tumbling through the hundred-meter rocks before concluding that it was a fool’s endeavor. Nobody, including my future self, would understand the wonder that I was observing without having experienced it in that moment now gone. I put my phone away. The waterfalls were now past, and the conductor was announcing the end of our journey through them. I turned my head from the slowing window, having but to face forward once more.